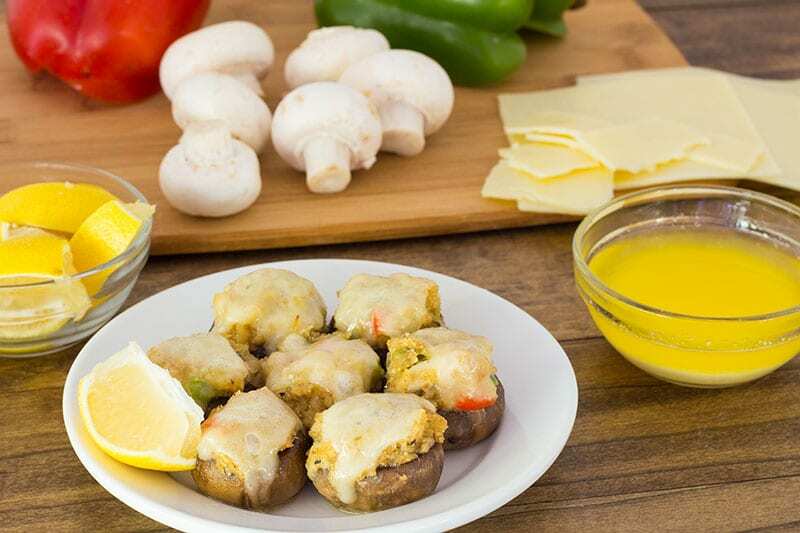 Crab Stuffed Mushrooms are perfect as an appetizer or paired with a salad for a light and satisfying summer meal. 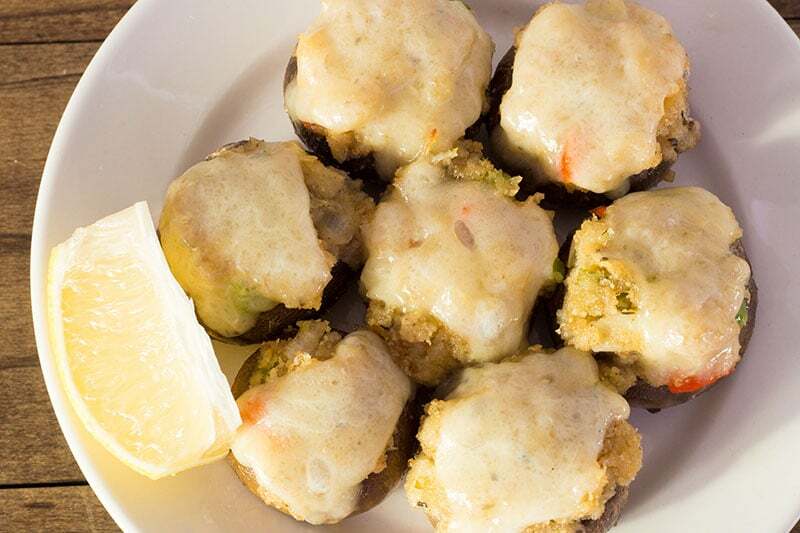 Mushroom caps are filled with a crab stuffing, topped with garlic wine butter sauce and white cheddar cheese then baked to bubbly perfection. Crab Stuffed Mushrooms remind me of the seafood stuffed mushrooms you can get at Red Lobster. More crab can be added if you want more of the crab flavor to shine through! These little bites of heaven would be great served at a DIY wedding recpetion, Christmas Eve dinners, or even as a Thanksgiving appetizer! 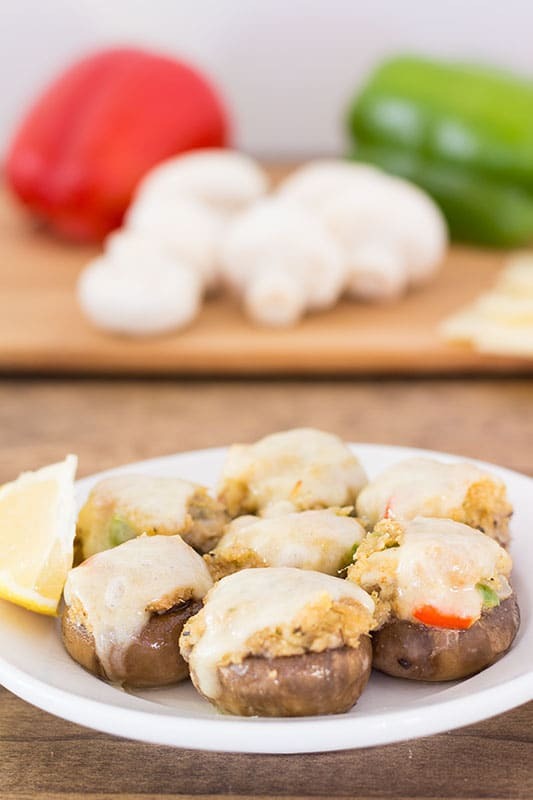 These crab stuffed mushrooms aren’t so fancy and expensive to make that you couldn’t carry them to a tailgate or casual backyard BBQ. They would also be great served as an accompaniment to a nice juicy rib-eye. I have probably done all of the above with them over the years. Red peppers and onions are simply sauteed in a bit of butter with the mushroom stems that have been diced up. No waste! Add some seasonings, the crab and just enough bread crumbs to hold it all together. The crab stuffing used here along with the garlic wine butter sauce would be perfect for making a stuffed flounder or even stuffed shrimp. Honestly, the garlic wine butter sauce would be amazing on just about anything. I use white cheddar cheese to top my crab stuffed mushrooms, but please use whatever cheese is your favorite. I bet gouda would also be the perfect match for these! I encourage people to always change a recipe to fit their own tastes. If you have leftover white wine, that will be perfect for this recipe. If you are like me and there is no opened bottle of white wine hanging out, this is one of the rare times I will say its OK to use the cheap white cooking wine you find at most grocery stores. With the addition of garlic and butter to the sauce, the wine is just there in the background adding a bit of acidity. 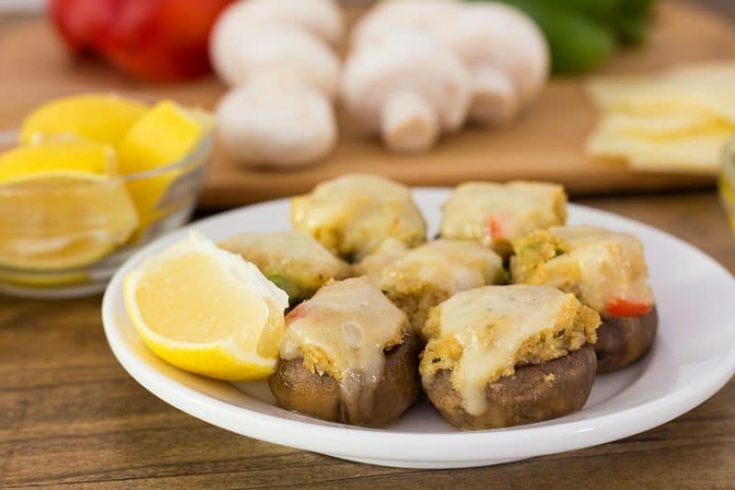 Serve stuffed mushrooms with lemon wedges for those who prefer lemon with their seafood. Crab Stuffed Mushrooms. 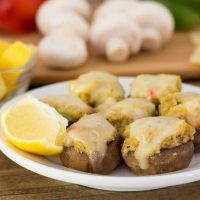 Recipe for mushroom caps filled with a crab stuffing, topped with garlic wine butter sauce and white cheddar cheese then baked to bubbly perfection. Spray baking pan with sides with baking spray. Gently clean mushroom and remove stems, reserving stems. Place mushroom caps, gill sides up in baking dish. Finely chop mushroom stems, you want about 1/2 a cup. Add ½ cup butter to a skillet and heat on medium until melted. Add chopped mushroom stems, garlic, onions, and green peppers. Cook until slightly softened. Turn off heat. Add crab meat, parsley, Italian seasoning, Parmesan cheese, and breadcrumbs. Mix well. The mixture may be a little dry, its OK, the mushrooms are going to give off the liquid and the mixture will absorb some of the garlic butter. Evenly distribute the mixture between mushroom caps. In a separate saucepan, melt ½ cup butter, add white wine and garlic powder. Drizzle over mushroom caps. Place in preheated 350 degrees F oven. Bake for 15 minutes, longer if you prefer your mushroom caps more cooked. Remove from oven and cover each mushroom cap with a small square of white cheddar. Put back into the oven and cook another 5 minutes. Keep warm until serving. Canned crab meat can be used for this recipe. More crab can be added. Remember to follow us on social media using the buttons below and sign up for email notification any time we post new recipes.